Hillary Clinton claimed Super Tuesday victories in the Georgia and Virginia Democratic primaries, while rival Bernie Sanders carried his home state of Vermont. WASHINGTON (AP) — Hillary Clinton claimed Super Tuesday victories in the Georgia and Virginia Democratic primaries, while rival Bernie Sanders carried his home state of Vermont. Republican races in those states were too close to call as polls closed. Super Tuesday marked the busiest day of the 2016 primaries, with the biggest single-day delegate haul up for grabs. With elections in every region of the country, the contests put a spotlight on candidates' strengths and weaknesses with a broad swath of American voters. 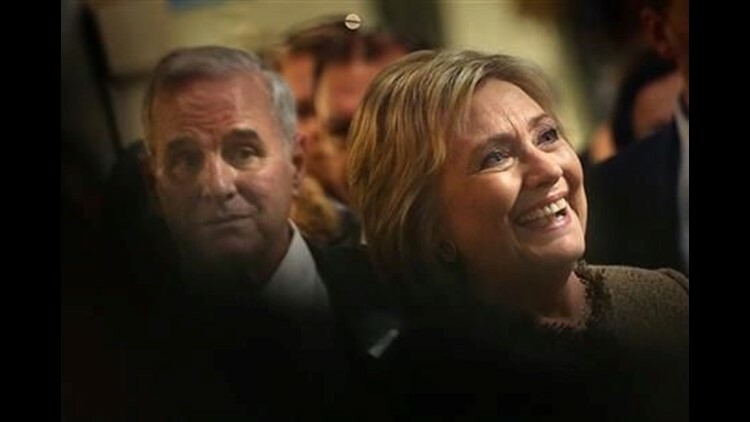 For Clinton, as well as Republican front-runner Donald Trump, the voting marked an opportunity to begin pulling away from their rivals and charting a course toward the general election. Each entered Super Tuesday having won three of four early voting contests, and more strong showings could start putting the nominations out of reach for other contenders. Clinton led in both Virginia and Georgia among both men and women, as well as black voters. Sanders continued to show strength with young voters, carrying the majority of those under the age of 30, according to early exit polls conducted by Edison Research for The Associated Press and television networks. Democrats were voting in 11 states and American Samoa on, with 865 delegates up for grabs. Republicans were voting in 11 states, with 595 delegates at stake. The contests come at a turbulent time for the GOP, given Trump's strengths in the face of opposition from many party leaders. Florida Sen. Marco Rubio and Texas Sen. Ted Cruz launched furious verbal attacks on the billionaire businessman in recent days, but some in the party establishment fear the anti-Trump campaign has come too late. Cruz once saw the Southern states that voted Tuesday as his opportunity to stake his claim to the nomination. Now his campaign's future hinges on a victory in his home state of Texas, the biggest prize of the day. Rubio's goal was even more modest. He was seeking to stay competitive in the delegate count and hoping to pull off a win in his home state of Florida on March 15. Even before the first results started flowing in, Trump was calling on Rubio to give up if he didn't win anywhere on Tuesday. "He has to get out," he told Fox News. "He hasn't won anything." Republicans spent months largely letting Trump go unchallenged, wrongly assuming that his populist appeal with voters would fizzle. Instead, he's appeared to only grow stronger, winning states and drawing broad support for some of his most controversial proposals. In six of the states on Tuesday, large majorities of Republican voters said they supported a proposal to temporarily ban all non-citizen Muslims from entering the United States, an idea championed by Trump. Two-thirds of GOP voters in Texas, Virginia and Georgia, 7 in 10 in Tennessee, and nearly 8 in 10 in Alabama supported the proposal, according to the early exit polls. Worries among Republicans appeared to grow after Trump briefly refused to disavow former Ku Klux Klan leader David Duke during a television interview. Trump later said he had not understood the interviewer who first raised the question about Duke, and he did repudiate him. House Speaker Paul Ryan said Tuesday that anyone who wants to be the Republican presidential nominee must reject any racist group or individual. "When I see something that runs counter to who we are as a party and a country I will speak up. So today I want to be very clear about something: If a person wants to be the nominee of the Republican Party, there can be no evasion and no games," Ryan said. The disarray among Republicans comes as Clinton appears to be tightening her grip on the Democratic field. Her wins in Georgia and Virginia were the first of what her campaign hoped would be a sweep of the South, a region where large segments of the Democratic electorate are black. In Georgia, just under half of Democratic voters on Tuesday were black, with 8 in 10 backing Clinton. About a quarter of Virginia's Democratic voters were black, and also overwhelmingly backed Clinton, according to exit polling. Democratic voters were more likely to want a continuation of Obama's policies than switch to more liberal policies in eight of nine states where surveys were conducted. Signaling her growing confidence, Clinton has increasingly turned her attention to Trump in recent days, casting herself as a civil alternative to the insults and bullying that have consumed the Republican race. "What we can't let happen is the scapegoating, the flaming, the finger pointing that is going on the Republican side," she told voters in Springfield, Massachusetts. "It really undermines our fabric as a nation." States holding voting contests in both parties were Alabama, Arkansas, Georgia, Massachusetts, Minnesota, Oklahoma, Tennessee, Texas, Vermont and Virginia. Republicans also vote in Alaska and Democrats in Colorado. Democrats also have a contest in American Samoa and for Democrats Abroad. Colvin reported from Valdosta, Georgia. AP writers Alan Fram and Andrew Taylor contributed to this report.